”For God is working in you, giving you the desire and the power to do what pleases him” (Philippians 2:13 NLT). We can do nothing in him or for him that doesn’t ultimately come from his grace. The Bible says, “For God is working in you, giving you the desire and the power to do what pleases him” (Philippians 2:13 NLT). We’re saved by grace. The only way to heaven is through the doorway of grace. You can’t earn it. You can’t work for it. You can’t buy it (Ephesians 2:8-9). We’re forgiven by grace. Though we don’t deserve it, God wipes our slate clean by his grace (Isaiah 43:25). We’re sustained by grace. God will never ask you to do anything he doesn’t give you the ability and the power to do. That power and ability is called grace (Philippians 2:13). We’re healed by grace. God heals our broken hearts and binds up our wounds even though we don’t deserve it (Psalm 147:3). We’re liberated by grace. Our relationship with Jesus isn’t a bunch of chores to do. Instead it’s about resting in what the Lord has already done. If your Christian life is not a life of resting in Christ, you’re moving into legalism (Matthew 11:28-30). We’re given talents by grace. God has given each of us the ability to do something well, and we’re to use those abilities for him (Romans 12:6). We’re used by grace. God uses us to fulfill his purposes in this world, not because of anything we’ve done but simply through his grace (Ephesians 3:7). We’re kept saved by grace. We cannot lose our salvation because it’s a gift of God. If you could earn it, then you could lose it the moment you stopped earning it (Jude 1:24). We’re transformed by grace. Through his grace, God makes us new through the renewing of our mind (Romans 12:2). We’re matured by grace. God’s work of making us more like Jesus happens not because we’ve earned it or by our own effort but by the grace of God (2 Peter 3:18). God’s grace is real and powerful in our lives. You might look at all these benefits and wonder, “How do I receive God’s grace?” Tomorrow’s devotional will focus on that question. Which of the 10 benefits above do you find the most difficult to accept? Why? 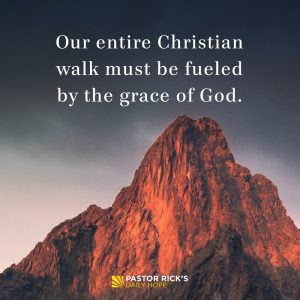 How can you take one of the benefits of grace mentioned above and help someone else understand and apply it in his or her life? What does knowing the benefits of grace give you the confidence to do or change in your life?